Procedures for Implementation of Campus Carry, Standard Administrative Procedure 34.06.02.M1.01, pertaining to Carrying Concealed Handguns on Campus, University Rule 34.06.02.M1, is approved. The President's Advisory Committee on Campus Carry Implementation has established proposed procedures for the implementation of Carrying Concealed Handguns on Campus, University Rule 34.06.02.M1. These procedures include guidelines for posting approved signage and the processes for requesting and reviewing requests for approval of areas where licensed carry of a handgun may be prohibited. The Texas A&M University System Board of Regents fully supported and endorsed the recommendations provided to them at their regularly scheduled April 2016 meeting. As a result, President Young has established the President’s Advisory Committee on Campus Carry Implementation to ensure consistent implementation of University Rule 34.06.02.M1. The committee will be responsible for developing and communicating procedures to the campus community and the President that address implementation of the rule by June 15, 2016, and submit those procedures for review as Standard Administrative Procedures by September 1, 2016. These procedures will address guidelines for posting approved signage and the processes for requesting and reviewing requests for presidential approval of areas where licensed carry of a handgun will be prohibited. The committee will develop a program to periodically review and update the list of premises on the Texas A&M campus where licensed carry of a handgun is prohibited by February 1, 2017. Throughout this process, the committee will provide regular updates to the Texas A&M community. After considerable efforts to engage the broad university community and gather feedback regarding the unique culture at Texas A&M, and with concern for safety and security guiding their decisions, members of the Campus Carry Policy Task Force comprising students, faculty and staff have made 14 recommendations, all of which I am pleased to fully endorse and almost all of which I have adopted intact and submitted to The Texas A&M University System Board of Regents. However, after discussion with A&M System legal counsel, as well as advice from the Office of the Attorney General of Texas, I modified the recommended rule related to campus carry in private offices. That proposed rule, as well as the other proposed rules can be viewed at http://www.tamus.edu/proposed-campus-carry-rules/. Absent further action by the A&M System Board of Regents, which will review these rules in April 2016, these rules will go into effect on August 1, 2016. The Task Force report is available at https://www.tamu.edu/statements/Campus_Carry_Final_Report_3-10-16.pdf (PDF). The 84th Texas Legislature passed Senate Bill 11, which expands the areas on public university campuses where those with licenses may carry concealed handguns. Universities have been given discretion to implement the law based on our unique campus cultures, with a focus on safety and the gathering and careful consideration of input from the broad campus community. To that end, I greatly appreciate your commitment to providing me with recommendations for the implementation of SB 11 at the College Station and Galveston campuses of Texas A&M University as a member of the Campus Carry Task Force. I request that the task force develop recommendations that will uphold the integrity of the law, ensure the safety and security of everyone on campus and foster a climate of mutual respect to create the most supportive learning environment possible. These recommendations should be based upon your considerable individual expertise, along with significant input from students, faculty and staff. Because SB 11 goes into effect on August 1, 2016, I ask that you provide me with your recommendations no later than April 30, 2016, to ensure sufficient time for review and implementation. Please note: the law specifically prohibits university presidents from establishing “provisions that generally prohibit or have the effect of generally prohibiting license holders from carrying concealed handguns on campus. A CHL holder can carry a concealed handgun on campus on a public or private driveway, street, sidewalk or walkway, parking lot, parking garage, or other parking area. A handgun license holder can now also carry a concealed handgun anywhere on a university campus, including in buildings, unless prohibited by state or federal law, or university rule. The changes enacted by Senate Bill 11 (Campus Carry) are effective August 1, 2016. Since 1995, a CHL holder has been able to carry a concealed handgun on a university campus in a public or private driveway, street, sidewalk or walkway, parking lot, parking garage, or other parking area. This new law permits a handgun license holder to carry a concealed handgun anywhere on campus, including in buildings, except where already prohibited by state or federal law, or the new university rules associated with changes in the law. The changes enacted by House Bill 910 (Open Carry) are effective January 1, 2016. However, this law does not permit open carry on a university campus. The changes enacted by Senate Bill 273 (Wrongful Exclusion of Concealed Handgun License Holder) are effective September 1, 2015. SB 273 permits the state to fine Texas A&M University if it attempts, by utilizing a Penal Code 30.06 notice, to prohibit a concealed handgun license holder from carrying a concealed handgun in a place not prohibited by sections 46.03 or 46.035 of the Penal Code. In other words, unless existing state law prohibits carrying a concealed handgun in a location, a state agency cannot bar carrying a concealed handgun at the location. The fine can be $1,500 per day for the first offense, and can be as high as $10,500 per day for a second or subsequent offense. 1. What is the university doing to prepare for campus concealed carry? SB 11 outlines the process universities must use to implement the new law. President Young assembled a Task Force to obtain input from students, faculty and staff to establish “reasonable rules” on campus carry. Recommendations developed by the Task Force were submitted to President Young in March, who fully endorsed and adopted intact all but one recommendation related to campus carry in private offices. Recommendation #7 (PDF) required modification in order to fully comply with SB 11. In accordance with the new Texas A&M policies on campus carry, President Young established an advisory committee tasked with advising him on the consistent implementation of University Rule 34.06.02.M1 (PDF), Carrying Concealed Handguns in Campus. This committee is charged with: supporting the consistent implementation of this rule and associated Standard Administrative Procedure; provide periodic review of premises approved under section 6.C.2 of this rule; and compile and maintain a list of campus premises where license holders are prohibited from carrying a handgun. The committee is currently reviewing and developing procedures and educational materials to provide to the Texas A&M campus community. Additional information will be provided over the coming months prior to Aug. 1, 2016, the date at which campus carry will become effective. On September 1, 2016, a month after the new university rule become effective, the university will be required to submit the rule to the legislature for review, including an explanation of why the university adopted the provisions. 2. Who can carry or possess a concealed handgun on campus now under current law (through July 31, 2016)? 3. Where on campus can a concealed handgun be carried now under current law (through July 31, 2016)? In a motor vehicle that is owned by the individual or under their control so long as the handgun is not in plain view and they are lawfully permitted to own a handgun. Can carry: Public or private driveway, street, sidewalk or walkway, parking lot, parking garage, or other parking area. 4. Does a handgun currently have to be concealed when it is being carried on campus? Concealed handgun license (CHL) holder intentionally or knowingly displays the handgun in plain view of another person in a public place, it is a Class A misdemeanor. Handgun is in an individual’s motor vehicle, it must not be in plain view. 5. What do I do if I see someone with a handgun on campus? The safest course of action is to call the Texas A&M University Police Department by dialing 911. They will respond and make contact with the individual to determine if that person is an authorized license holder and is legitimately carrying a firearm. 6. What if someone has a handgun in violation of the law? What is the penalty? Having a concealed handgun license (CHL) is not a defense to prosecution for any of the above. Class A Misdemeanor (Unlawful Carrying Weapons – Texas Penal Code §46.02) if carry a handgun anywhere on campus, other than those places listed above, without a CHL, unless the individual is in a motor vehicle and the handgun is not in plain view. On the premises where a high school, collegiate, or professional sporting event or interscholastic event is taking place, unless the license holder is a participant in the event and a handgun is used in the event. 7. What are the requirements to obtain a concealed handgun license in Texas? 8. What will the new law on campus carry allow that is currently prohibited? Current law allows concealed handgun license (CHL) holders to carry a concealed handgun on a university campus only in parking lots, parking garages, driveways, streets, sidewalk or walkway and other outdoor areas, except where an activity sponsored by TAMU is being conducted. Beginning September 1, 2016, public four year universities must allow concealed carry of handguns in buildings by handgun license holders. Universities will be allowed to designate certain areas on campus where carrying of concealed handguns by license holders is prohibited, subject to system and legislative review. 9. What are the requirements to obtain a handgun license? 10. 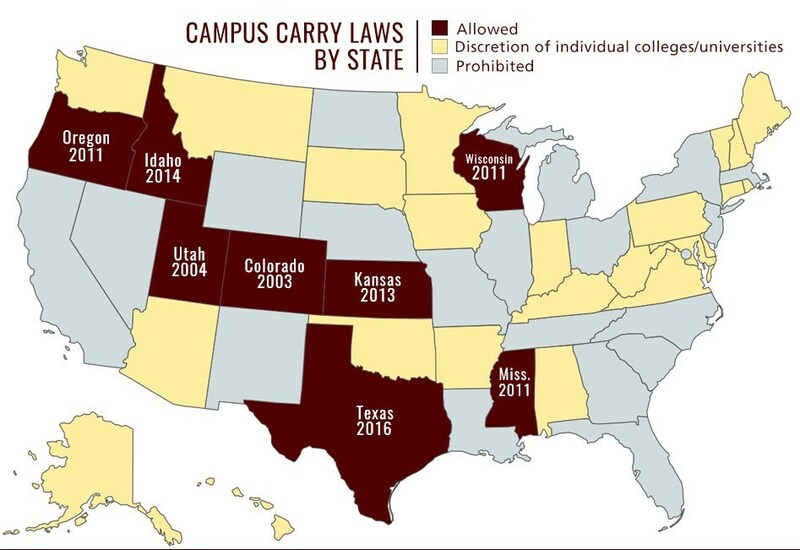 When does the new law on campus carry take effect? August 1, 2016 for public four-year universities. September 1, 2017 for two-year public colleges. 11. How many people have a concealed handgun license in Texas? As of December 31, 2014, the Texas Department of Public Safety reported that there were 825,957 active concealed handgun license holders. The population of Texas was 26.96 million in 2014; 2.7% held a CHL. In 2013, 0.03% of CHL holders had a criminal conviction. In 2014, 0.12% of CHL holders had their license revoked. 12. What is “open carry” and when does it take effect? On June 13, 2015, Governor Abbott also signed into law House Bill 910. This law permits handgun license holders to openly carry (no duty to conceal) a handgun in areas where it is not prohibited by law. This law becomes effective on January 1, 2016. 13. Will the new open carry law allow license holders to openly carry a handgun on campus? No. HB 910, the open carry law effective January 1, 2016, provides a handgun license holder cannot carry a partially or wholly visible handgun, regardless if it is holstered, and intentionally or knowingly display the handgun in plain view of another person on the premises [building] of a university, or any driveway, street, or parking area of a university. 15. Can I personally make a rule that someone who has a license to carry a handgun cannot carry it into my office, classroom, or laboratory? No. Effective August 1, 2016, concealed carry is allowed on university campuses, including all offices, classrooms, and laboratories by anyone holding a valid handgun license, unless carrying a handgun is prohibited by state law, federal law, or university rules. SB 273 prohibits the university and its employees from imposing restrictions greater than those imposed by law. Violations of SB 273 can result in a fine to the university as high as $10,500 per day. Please see the Campus Carry Final Report (PDF) (PDF)for additional information. 16. If someone does not have a license to carry a handgun, can they carry a handgun on campus under the new law? No. Carrying a concealed handgun is only legal if an individual has a handgun license. State law does permit those without a handgun license to carry a handgun in their vehicle if the handgun is concealed and the person can legally possess a firearm. See Texas Penal Code 46.02(a)(2). 17. If someone without a license carries a handgun on campus, what are the penalties? If the person is a student, faculty member, or staff member they can be sanctioned according to the rules applicable to their status. It may also be a violation of the criminal law. The offense can be a misdemeanor or a felony, depending on where the handgun was carried. 18. Can an international student legally in Texas on a student visa obtain a CHL? 19. Can an undocumented international student obtain a CHL? No. Undocumented students are not legal residents of the state. To obtain a CHL, a person must be a legal resident of the state for a 6-month period preceding the date of the application. 20. Is a handgun license holder required to display identification if asked to by a magistrate or a peace officer? Yes. The license holder shall display both the license holder's driver's license or identification certificate issued by DPS, and the license holder's handgun license. Texas Government Code § 411.205. 21. Is a handgun license holder required to respond if someone other than a peace officer or magistrate asks them if they have a handgun license? No. A handgun license holder is not required to disclose he has a license to anyone except a magistrate or peace officer. A person engaged in lawful activity (i.e., applying for and obtaining a handgun license) is not required to provide information to any person, including a university official, about their personal choices, beliefs, or practices. 22. What would preclude someone from getting a handgun license? 23. What states have a reciprocity agreement with Texas so handgun license holders from other states can lawfully carry in Texas? There are 42 states that have a reciprocity agreement with Texas. When in Texas, license holders from other states must follow Texas gun laws, not their home state’s gun laws. 24. What states do not have a reciprocity agreement with Texas? Illinois, Maine, Minnesota, New Hampshire, Oregon, Vermont, and Wisconsin. 25. What will happen if a minor gains access to my handgun? It is a violation of criminal law if a child (person younger than 17) gains access to a readily dischargeable firearm and the person with criminal negligence failed to secure the firearm; or left the firearm in a place to which the person knew or should have known the child would gain access. (Texas Penal Code §46.13). It is an affirmative defense to prosecution that the child's access to the firearm was supervised by a person older than 18 years of age and was for hunting, sporting, or other lawful purposes; or that access was gained by the child trespassing on the firearm owner’s property. (Texas Penal Code §46.13). 26. What will happen if an adult gains access to my handgun? It is not a violation of Texas law for a handgun owner to permit an adult to gain access to a handgun. 27. Does Texas A&M University offer a concealed handgun license course? No. Courses are available locally from various gun shops, sporting goods stores, and individuals licensed as a Qualified Handgun Instructor. 28. Will the university track handgun license holders on campus?